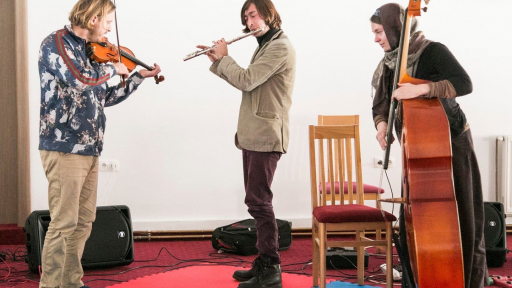 Our OneBeat Balkans program brings musicians from Kosovo, Serbia, Albania, Croatia, Macedonia and the United States to collaboratively create music and multi-disciplinary works, lead public workshops, and use the arts to establish trust and encourage economic development in a divided region. Visit our People page to read bios and watch videos of our 15 international fellows. And keep up to date on the tour by following along on the dedicated OneBeat Balkans Instagram and Facebook channels. We’re thrilled to announce that applications are now open for our first-ever OneBeat Balkans program! 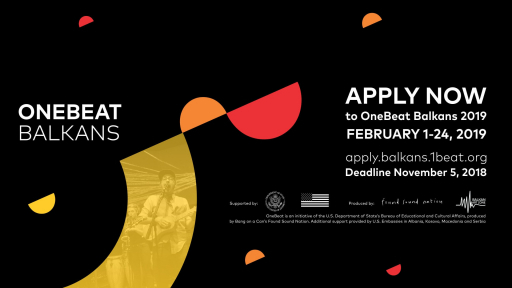 If you’re a musician from Albania, Croatia, Kosovo, Macedonia, Serbia, (or a U.S. OneBeat alum), we encourage you to apply now! The fully-funded program will run February 1-24, 2019. To apply, visit: apply.balkans.1beat.org OneBeat Balkans is an initiative of the U.S. Department of State Department of Educational and Cultural Affairs, produced by Bang On A Can’s Found Sound Nation and Balkan Art Zone, U.S. Embassy Pristina, Kosovo, U.S. Embassy-Tirana, U.S. Embassy Belgrade, U.S. Embassy Macedonia, and U.S. Embassy Zagreb.